The new year began for my husband and me with a trip to San Francisco. June of this year marks our 50th wedding anniversary, but because of his work commitments we don't always have two weeks of vacation in the summer. So, we thought we'd fill the year with several shorter trips. San Francisco was amazing! We also experienced a 4.4 earthquake, which was twice the size of the one we experienced on our last trip in April. Hmmm. However, being away for the first week of the year, and taking most of another week to get over jet lag put me a bit behind in getting to my resolutions. I don't really do "resolutions," but I like to set some intentions and get organized. The getting organized part is fun for me. The intentions part is more complicated. Although I don't intend to lose weight and never use the word "diet," I joined Cathy Zielske's FIT course this year to keep me on track with self care. Getting back to my craft studio took longer than I planned. After a day when nothing seemed to work with the cards I was attempting, I decided to devote a little more time to organizing my studio, using Jennifer McGuire's excellent organizing tips for stamps, stencils, and dies (all of which have been increasing crazily in my stash this past year). Organizing for me is like rebooting a computer. Today I was ready to once again create a card for a couple of challenges. 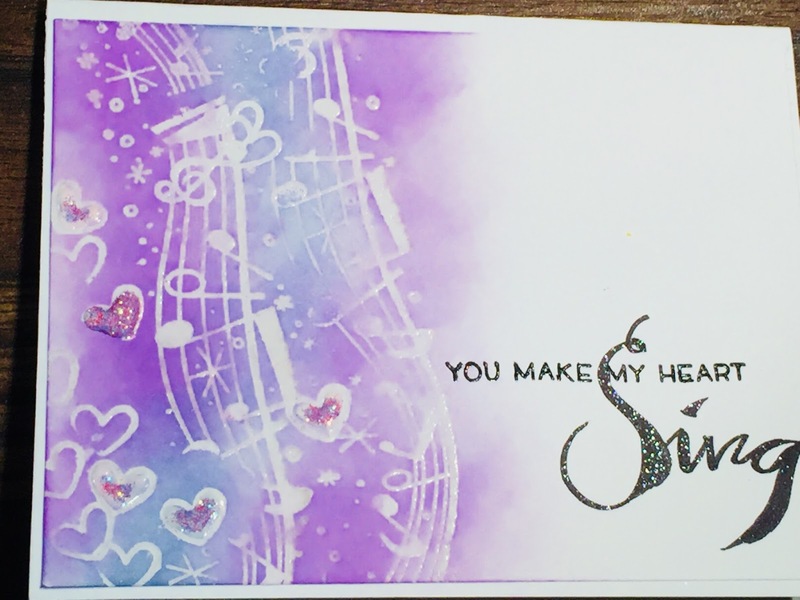 I chose to make a card that would work for both Addicted to CAS, "Music," and Less Is More, "Purples." This was really a challenge for me. I don't use purple a lot, and Ireally wracked my brain for something that would fit the "Music" category. 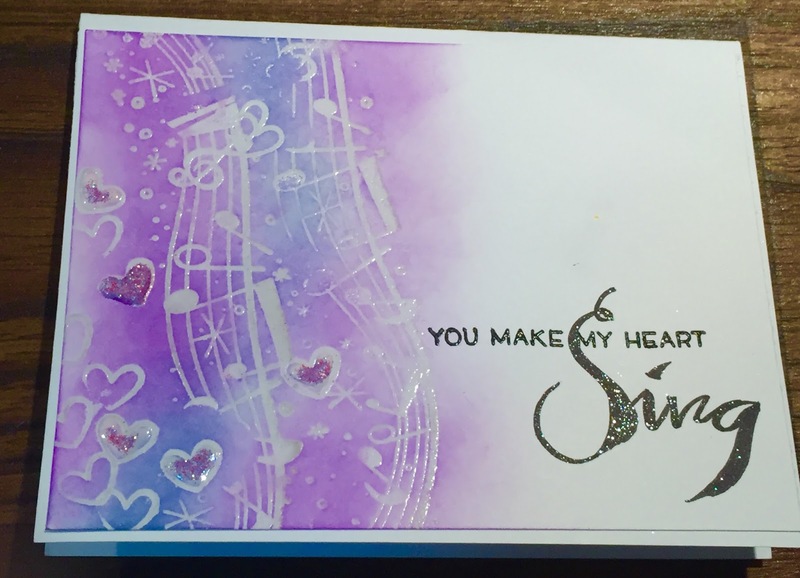 At last I remembered a stamping wheel from Stampin' Up! with musical notes and I went to work. First I loaded up the wheel with Versamark and stamped it on some Neenah Classic Crest solar white. Then I embossed with clear embossing powder, so I could create a resist with distress oxide inks. I used wilted violet with a tiny bit of faded jeans, then wiped off the embossed area with a baby wipe. I filled in some of the hearts with crystal gloss white Nuvo drops. The stamped sentiment is from Lawn Fawn's Beary Happy Holidays set. The rest of the sentiment is my very rusty calligraphy, using a Spectrum Noir glitter brush pen in black. While the Nuvo drops were still drying, I felt like it still needed a little something, but I didn't know what. I opened my newly-organized embossing powder drawer and, lo and behold, there was a little jar of purple glitter! I sprinkled that on the hearts and decided to stop there. 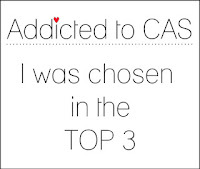 This is a CAS card, after all! Now I feel like the new year has begun. Thanks for looking! 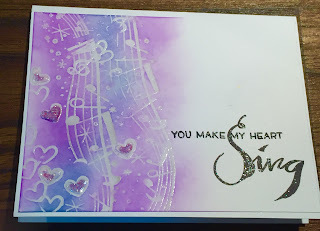 Beautiful card ! Love your purple background for this music theme. A nice combination of the two challenges. And congratulations for your calligraphy, it is really stunning ! Thanks for sharing and for playing along at Less is More ! I get it, ROCK! Thanks, Kathy! Great card love the colors. Thank you for joining us over at ATCAS. I love your card Kathy. The colours and layout are just beautiful! A stand out! 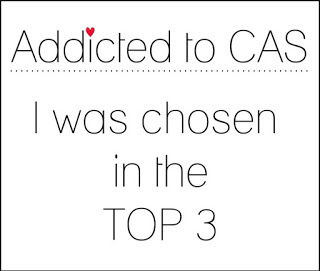 Thank you for playing along with us at Addicted to CAS.